An Elegy, according to Wikipedia, is a ‘poem of mourning... a reflection on the death of someone....” This is certainly true of Aleksandr Sokurov’s film titled Moscow Elegy. It is a poetic reflection on the death of a friend and fellow artist. Moscow Elegy is also an icon in that very religious and Russian sense of the word (let’s spell it “ikon” to make it clear we’re not talking about James Dean). 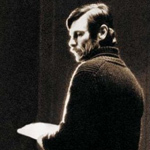 The subject of this particular elegiac ikon, the object of Sokurov’s veneration and melancholy, is another Russian film director, Andrei Tarkovsky, who had just died the previous year. Russian ikons are characterized by a near-manic attention to detail, along with a stylization that seems almost distorted to modern Western eyes. Every hair on the saint’s head is painted with singular loving care and the eyes are always sad but in that Russian sad/sentimental way that encompasses the enormity of life and death. In those eyes is a satisfying melancholy that will carry you through a Russian winter or a tyrant’s reign. What Sokurov has done is to paint an ikon in film. He has made a tiny, detailed monument of veneration and loss to his idolized mentor Tarkovsky. Moscow Elegy might be problematic for an American audience as we are not (to make a gross generalization) as sentimental or poetically minded as the Russians. When Sokurov says, with some considerable awe and reverence, “this is the apartment Tarkovsky lived in for 12 years... here he sat... there is the window from which he looked out onto the world...” we Westerners only see a shabby apartment, an empty chair and a window that opens on to nothing in particular. If it is the inner poet that then turns the humble scene into a saintly one, then the film may seem trivial to cynical Western ears and obscure to our eyes. Moscow Elegy is not is a classic documentary that would educate its audience on a particular subject. You probably will leave the film knowing a little more about Tarkovsky, but not necessarily why he was a great director. I think to fully appreciate Elegy, you have to come to the screen with some knowledge of who Tarkovsky was, what he did, and how he died. Moscow Elegy is a personal tribute by Sokurov and is intended for a knowledgeable audience. Just as you must have some knowledge about a particular saint to appreciate and ‘read’ a Russian religious ikon, so too you must first have some appreciation of Tarkovsky’s work to then appreciate Moscow Elegy. Nor is Moscow Elegy a grand, sweeping statement about Tarkovsky. Like a Russian ikon, it’s a miniature, done with some intense detail and some abstraction that can be opened, admired and venerated and then closed and kept next to your heart. This is not the stuff of popular American cinema, but it’s a nice piece of film none the less. The imagery is often archival and rough, and the sound is often only field-quality. Occasionally the shots are intentional and quite nice, but don’t watch this DVD for the picture or sound alone. Read up on Andrei Tarkovsky and/or watch Solaris again to get yourself in a Russian mood.